Timely trade alerts … bringing opportunities to you faster! TradeSetup alerts are selected by our proven professional traders Davin Clarke and Braden Gardiner (i.e. not software). Our historical trade alert results have not only been exceptional but have also been consistent. Our unique alerts are specifically designed to identify high conviction opportunities in real-time, not the next day or the next week. 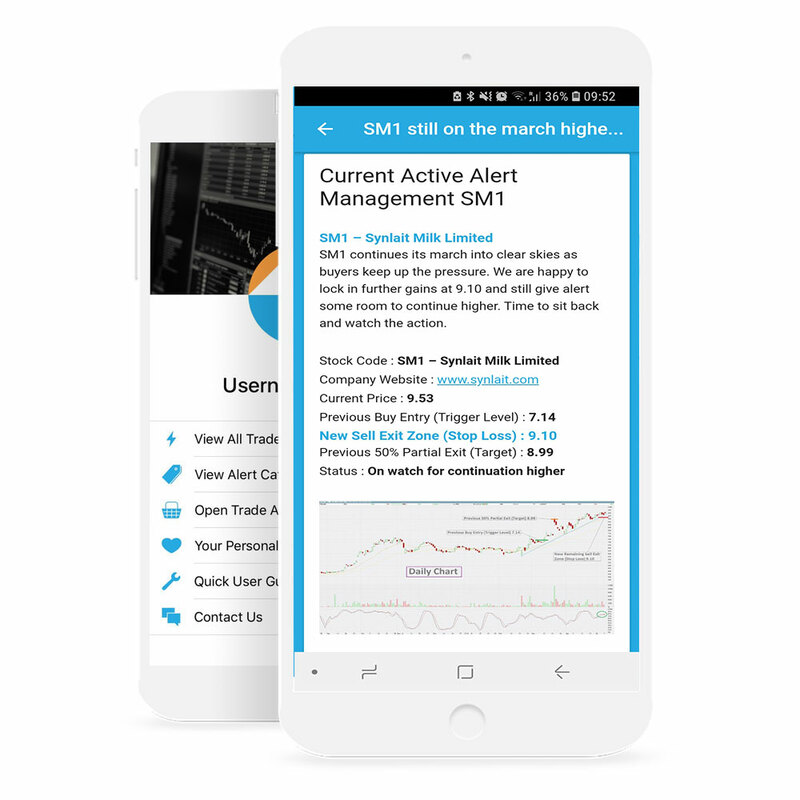 Alerts are also designed to help you improve your trading results and in turn develop the confidence, knowledge and ability to grow your own investment portfolio. Alerts include new trade setups that are ready to go, potential setups to watch, management alerts and important market news and market wrap ups. They watch the markets all day, and advise clients of the stocks on their radar. Clearly defined entry points are provided, supported by a diagram of their preferred price action. I like “TRADESETUP” website because the layout is so simple but very effective with a flawless look. Beyond the terrific educational benefit from seasoned traders, what I like the most with TSU subscription is their discipline to stay with a positive expectancy trading system, regardless of the noise. Just letting you know your call on BPT more that covered the yearly subscription. I’ve been tuning in to TradeSetup from their commencement. To log in, click on the TradeSetup icon on your phone, click on the latest alert and enter your username and password. You’ll then have access to the latest alerts. Whenever a trade alert is sent out, you will receive a push notification letting you know. Just click on the TradeSetup icon and click on the latest alert in the list to see the analysis. TradeSetup provides timely trading alerts and news events. TradeSetup is a trading name of Dynamic Capital Trading Pty Ltd. Dynamic Capital Trading Pty Ltd is licensed to provide general advice services. (AFS License 495685). Past performance is not a reliable indicator of future returns. The TradeSetup Alerts have been prepared without taking account of the customer’s objectives, financial situation or needs; and because of that, the customer should, before acting on the advice, consider the appropriateness of the advice, having regard to their objectives, financial situation and needs. Before making a decision about whether to acquire a financial product the customer should obtain a Product Disclosure Statement or offer document from the relevant financial service provider.